Have you ever woken up to find that, for some reason, you seem to have smashed your alarm clock into a million tiny pieces several hours ago in your sleep? Then it hits you, you need to get to the airport! We think everyone has, which is why we all tend to schedule packing our bags at least a day in advance to make sure we don’t waste any more time. But packing can be a tedious, often frustrating process in and of itself. So, what can you do to make this process easier on you? Simple, use packing cubes. 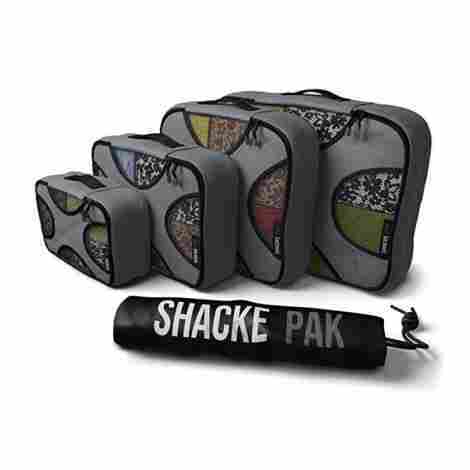 Kicking off our list, we have the Shacke Pak 4 Set Packing Cubes. Shacke Pak, despite not the most grammatically correct of names, is one of the biggest up and comers in this business, and, while you won’t see a single brand on this list twice, make consistently great products. Let’s find out how. That X motif the cubes go for with the lids of their suitcases is way more than just an eye catching design gimmick, though it definitely does that too. This X design helps to reinforce the lid through clever implementation of double stitching techniques that holds all the clothes inside in place. It also prevents the bag material from folding upwards from the middle, potentially damaging what’s inside. If you’re the kind of organization obsessed person who would adore having a packing cube set, then you’re likely also the kind of person who’s always been grossed out by having to put your dirty clothes right next to your clean ones throughout the vacation. If that’s you, then these packing cubes have likely already gotten your money, because they come with their own premium quality, reusable laundry bag, for putting away those pesky dirty clothes. The weirdest thing by far about packing cubes is that, despite their insanely high quality, multiple features, and high production value, they don’t cost all that much compared to single suitcases. When compared to what you’ll pay for a decently high quality single suitcase, this packing cube set may as well cost chump change. 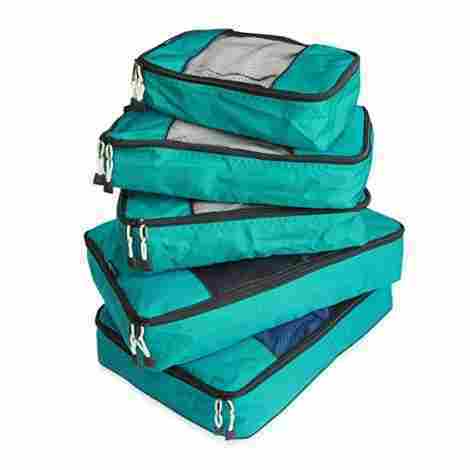 In second place, we have the Bagail 6 Set Packing Cubes. Continuing the trend from the previous entry, a trend that is likely to keep up moving forward, this packing cube set also provides incredibly high quality material for very good deals. So, with that said, let’s look and see how it measures up. When discussing the durability of any suitcase, not just packing cubes, you’re discussing less the materials used to make up the structure, and more how well those materials are put together. And this one has almost everyone else in the competition beat, and all through simple, but clever implementation. Through strategic use of seams both on the outside and inside, the seams of these cubes are better implanted and thus better equipped to handle the strain of whatever you put in them. You’ll feel like a mastermind when you assemble this packing cube set for the big trip and pass through any airline check for overweight items. Despite everything that you put in these cubes, they can easily fit like a glove into most airline carry-on suitcases. So, if you’re strapped for cash, you can at least avoid the overweight charge. It’s not that the prices of these sets are small, because technically they aren’t. But as this entry demonstrates, when you tally up everything that these cubes do for you, the price becomes basically nonexistent because what you’re getting out of it dwarfs what you end up paying for it. 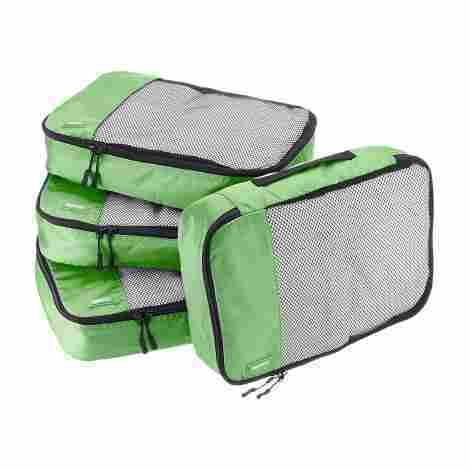 Finishing up our top three segment of this list, we have the Yamiu 7 Piece Packing Cube Travel Organizer. Before you ask, no, we’re not going to see any packing cube sets that stretch into the double digits, though one or two come about as close to that as one can. But anyway, this packing cube set doesn’t need to, as every piece in this set serves its own purpose. It was quite notable how the first entry on this list had a bag for dirty laundry for you to use in order to avoid packing your clean clothes with your filthy ones. And while this set doesn’t have that, it does make up for it by having two different toiletry bags (one for the trip, one for plane rides) and a bag for your shoes in case they get dirty during the trip. Even among other packing cube sets, these are some of the most lightweight packing cubes we’ve ever seen. And with high quality nylon fabric held together by great seams and strong double zippers, they’re also some of the best designed. Despite everything we just mentioned, and despite having more items in its set than either of the previous entries (and quite a few of those to come) this is one of the most affordable packing cube sets on the entire list. 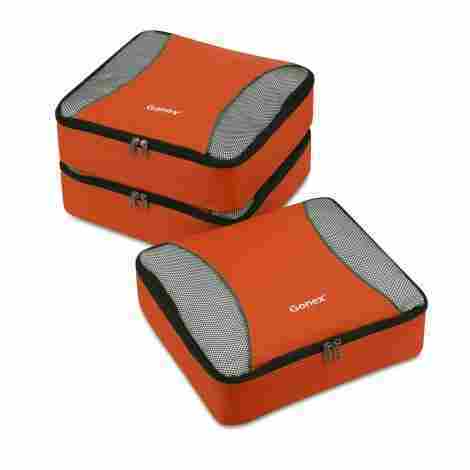 Coming in at #4, we have the Gonex Travel Packing Cubes. Though we have definitely taken a step back with the amount of cubes available in each set, that doesn’t stop this set of cubes from being one of the absolute best on the market right now. Now, let’s take a look and find out why that is. Being much smaller than the average suitcase or even average packing cube, it’s more important that these cubes be particularly durable so they can handle the larger amount of objects you need to put in them. Fortunately, this set has that covered, being made from durable ripstop nylon fabric designed in an equally durable honeycomb formation. For cubes this size, the zipper can sometimes be more likely to jam compared to larger models. But this packing cube set uses double way zippers that pull forward and back a lot easier than those of most of their peers. And the webbing style handle of the cubes makes them incredibly easy to carry. Once again, we have a packing cube set that is very affordable despite the features it offers you and the high quality materials it’s made out of. A lot of this may be because of the lack of unique bags and features, but as the previous entry showed, that is not an airtight case. 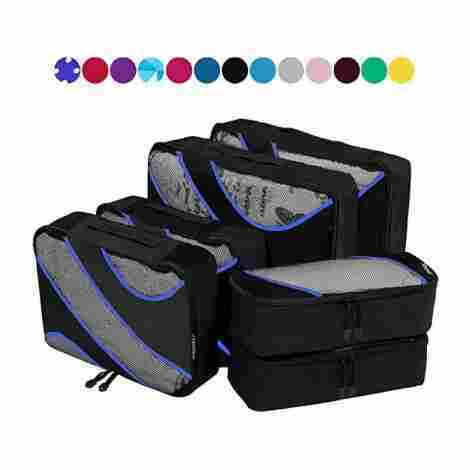 For our #5 spot, we have the Pro Packing Cubes 10 Piece Travel Cube Set. The biggest selling point about this set is obvious: it’s easily the largest set on the entire list, at a whopping 10 cubes in the entire set. But don’t think that this makes them any less convenient, as that is most certainly not the case. Obviously, the ease of organizing your luggage is the biggest selling point offered by packing cubes. And the larger amount of cubes in this set doesn’t even put a dent in the convenience it offers, as the specific design of these cubes makes organization and compression of clothing much easier. It may seem a bit silly of us to presume that you’re going to need ten different cubes for one trip, even if they’re incredibly convenient, who really needs that many? Well, that’s true, but here’s the thing. These are some of the most versatile cubes on this list. Their varying sizes allow them to be used for several different purposes. The slimmer ones can hold toiletries or shoes, for example. 5 entries in and only now do we get an entry with a price we honestly expected to see sooner when first putting together this list. Not to say it’s unreasonably expensive, but the higher number of cubes definitely adds onto the price, making it at least twice the price of the previous entries. Coming in at #6 is the TravelWise Packing Cube System. It may seem like we’ve covered all of the best entries already since once again, this set isn’t anything too extravagant or fancy, just a set of packing cubes. Well, this is where you’d be wrong, as there is more going on with this set than meets the eye. They may look like normally designed cubes without much flair to them, but that’s because you’re only looking on the outside. Whereas a quick look at the cube’s interiors show that they are specially designed to keep everything you put in there as organized and easy to find as possible. Not only are these packing cubes great at making sure you’re never at a loss as to where each item in the cubes is, but they can also hold much more luggage than their size would otherwise let on. And yet despite this, they still maintain a lightweight, easy to carry nature, that has made this brand famous among fast travelers. Coming back down to more reasonable prices, for what we’ve seen so far, the price of this packing cube set is pretty standard fare. A bit higher than some, but lower than others. For our #7 slot, we chose the AmazonBasics 4 Piece Packing Cube Set. Because Amazon wasn’t quite satisfied with how their conquest of the world via an internet shopping site was going, they decided to be extra thorough by making a variety of other products, including this one. But despite our snark, we wouldn’t have it here if it wasn’t worth having. When packing for a trip, the usual advice is to pack the delicate fabric in the middle, between tougher clothes such as jeans and shirts, because the mesh interior lining of some suitcases can damage softer or thinner fabrics. This actually won’t be a problem with these packing cubes, since their interior lining mesh is so soft, your delicate fabrics won’t even be scratched once you take them out. This very common feature of packing cubes is one of the reasons that TSA agents love packing cubes. The mesh top panel of these cubes give outside observers a quick look into what’s inside the cube in question, making it easy for you to remember which cube holds what, as well as making it easy for baggage checkers to get a good idea of what’s inside. This is one of the cheapest entries on the entire list. You could argue that the margin between the price of this and the other entries is very slim, but it’s wide enough to be notable. 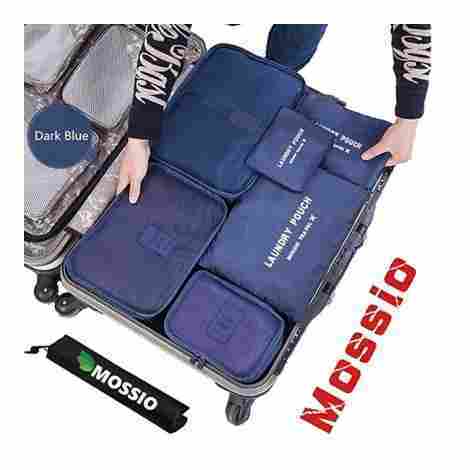 Kicking off our final three entries, we have the Mossio 7 Set Packing Cubes at #8. The main difference between this set and others is that they don’t come with their own larger bag to fit them all into. It’s exclusively smaller bags meant for whatever suitcase you have on you already. So, let’s see how this one measures up with that in mind. Doing laundry means that you need to have the right cleaner, bleach and so forth on you so that you can effectively clean your clothes during the trip should the need arise. But where to put those items so a spill won’t affect the rest of your clothing? Simple, put them in one of the two laundry bags that comes with this set. 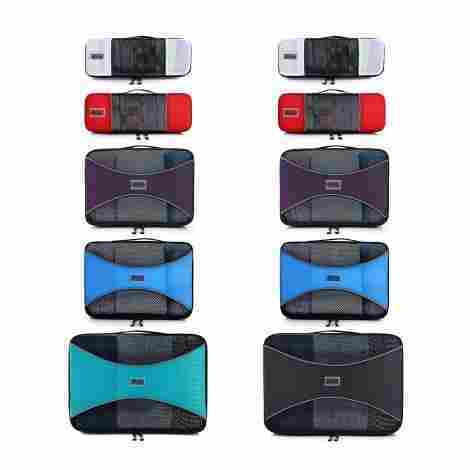 Don’t let the small size of these packing cubes fool you, as like with the previous small entries on this list, the interior volume greatly makes up for the compact outer appearance. You’ll be amazed at just how much you can fit into even just one of these cubes. We just keep getting cheaper, as the biggest benefit of this set going mini is that it’s the cheapest entry yet. If you need a really good packing cube set for a very affordable price, then this is the set for you. For our second to final entry, we have the JJ Power Travel Packing Cubes. This is probably the least impressive looking entry on this entire list, just a couple of pale tan packing cubes that don’t look like anything special. But as you probably know by now, it wouldn’t be here if we didn’t think otherwise. We don’t usually think about the quality of the zippers on our luggage, even though they are the only things standing between your luggage and the floor. So, it’s imperative that the zippers used to hold together the lid and the cubes be as high quality as possible, Something JJ Power took to heart with this product. Functionality isn’t always pretty, and though not the most aesthetically pleasing things to look at, these packing cubes are some of the hardiest entries on this entire list. Made from ultra durable oxford fabrics, this set of packing cubes will take on whatever you put in them without breaking a proverbial sweat. While not quite as cheap as the previous entry, this is still an incredibly affordable entry for this list. Great for those who need quality packing cubes, but also need to adhere to a tight budget. 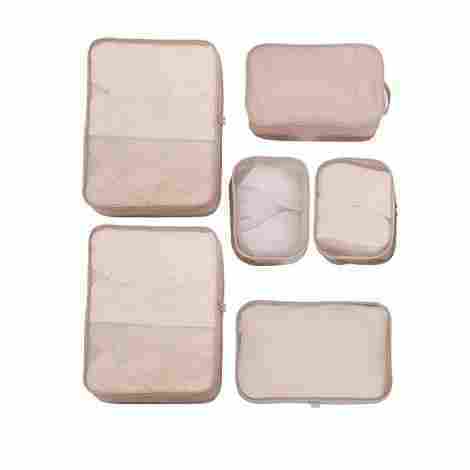 For the final entry for this list, we have the OEE 7 Piece Packing Cube Set. Unlike the previous two entries, this one comes with its own carrier to fit all 6 of the packing cubes into in a convenient and quick manner. Now, let’s see what else our final entry has to offer. Other entries on this list have cubes meant to hold certain types of clothing, but this one goes more specific than any of the others dared to, taking full advantage of each of its seven cubes. There’s one for normal clothes like pants and shirts, a shoe bag, a bag for underwear, and finally a toiletries and laundry bag. The design of these bags is rather unique for what it’s trying to do, instead of the usual design aesthetics that characterize the outer lining of the other entries on this list, this entry opts instead for a lace buckle design which you’ll find helps you pack clothes much more neatly than other potential entries that this one beat out for this spot. This one costs about the same as the previous entry, except this one is actually the much better deal because it offers so much more and yet charges this little for it. If you’re the kind of person who is very meticulous about the way they pack their bags or are frustrated with the way other suitcases clutter up everything you put in them no matter how well you organize them, if that describes you, then we cannot recommend you a set of packing cubes enough. They are everything you’ve been asking for from luggage carriers. They’re meticulously organized, easy to carry and generally deal with, and are way easier to afford than you might think. A product with this many features should be more out of the reach of the average consumer, but as we’ll get more into later, the best part about packing cubes is their affordability. But even barring that, we can safely say without a shadow of a doubt that every single entry on this list is worth your time and money. They are all a welcome reprieve from the usual types of suitcases people have to deal with. Every one is the epitome of convenience, practicality, and efficiency, even among their countless peers, all of whom do much of the same. So, if you need a quick, efficient alternative to the average suitcase, then we see no reason why one of these ten packing cube sets won’t be exactly what you’re looking for. Packing cubes, despite their differences being notable, actually have quite a few similarities with normal suitcases. So, when it came time for us to assemble a list of criteria to evaluate which entry got onto the list, and once on the list, how far up the list they got from there, we just asked ourselves what we want out of a really good suitcase, and that gave us a lot of what we needed. The more niche material followed after that baseline was established. So, with that said, here are the most vital criteria we determined to use for this list’s evaluation. With a lot of these packing cubes, the features they offer tend to blend together after a while. A lot of the best features of packing cubes are considered standard procedure, which is why a lot of the bullet points in the pros section of each entry started to look the same after a while. Yet despite this, there is a library of other features that some include, and some don’t, and this is where the sticking points lied. There are many different features that some higher quality packing cubes like to implement. Most of them just boil down to having more specified and niche versions of the same cubes. It could be a bag meant to hold your shoes, your laundry, toiletries, etc. or it could be a bigger suitcase meant to hold the smaller cubes. It’s honestly astounding just how many different variations these items can make on the same basic idea. And how well these variations were implemented was a huge part of deciding who got on the list and where. One of the biggest criteria for any kind of travel case, in general, is its durability. After all, any amount of money you spend suddenly becomes a rip-off when the case you spend that money on falls apart on you the very instant you actually need it. For this, you have to look at two different factors: what the cubes are made out of, and what’s being implemented to hold the case together. The most commonly used material used to make packing cubes is nylon, though other materials such as oxford fabric are also common. The type of nylon also tends to waver, some going for basic nylon since that’s usually more than enough, and some going the extra mile by having extra strength ripstop nylon. And then there’s the other half of that coin. 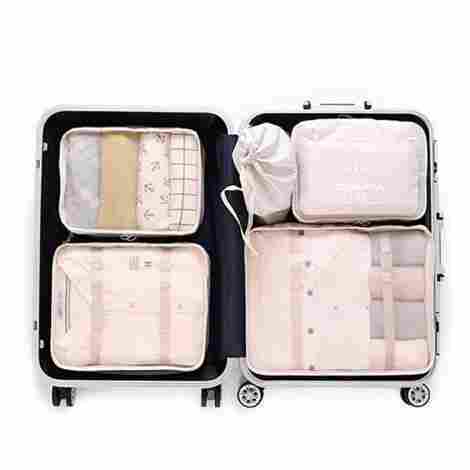 Of course, packing cubes go the same route for keeping themselves together as normal suitcases, that is keeping themselves together through stitched seams. These usually work just fine, but under the right set of circumstances, they can come loose. Which is why the really good packing cubes opt to have their seams be double stitched, which adds extra strength. However, there is another way to handle this. Seams are only as strong and resilient as the parts of the suitcase in which they’re implemented. And so, the really clever manufacturers make sure to put few seams in strategic points across the interior of the cube, which adds even more strength to the seams ability to hold the whole thing together. This is probably the biggest one. The main selling point, after all, of these packing cubes, is the fact that they’re supposedly the more practical and easier to handle version of your run of the mill suitcase. So, when assembling a list of criteria surrounding packing cubes, how well they live up to that promise becomes a lot more important a criterion to consider. This typically boiled down to how many cubes there were in the set, how often you were likely to use them, and how easy it is to fit that number of cubes into a suitcase to carry with you to your destination. There are also other, smaller factors that were less scrutinized, but considered nonetheless. This includes whether or not the cubes have a mesh top that lets you look inside, whether or not the cubes have interior pockets for smaller objects, among many others. Convenience is a concept of both big and small ideas, and as such, both must be considered. In all honesty, we thought this was going to be a lot bigger a criterion than it ended up being. The best part about packing cubes, as we said earlier, is how astoundingly affordable even those of the highest quality tend to be. There was only one entry on this entire list that we would call pricey, but if it were on any other list, that would most certainly not be the case. Packing cubes are the ultimate in convenient storage for even more convenient price. But despite this, our usual way of doing this still held true. Like we always do for these criteria, we judged each entry not by the price itself, but by what the product was doing to justify that price. The more features it had, the more durable it was, how convenient it was to use, etc. were all used as criteria for this criterion. And for once, almost every entry actually passed, though most of that lends to the affordable prices the entries were at. For our final segment of this article, we’re looking at the most frequently asked questions about packing cubes we could find. Packing cubes are surprisingly complex carriers, so there were quite a few FAQ’s that we found out there. So, with that said, here are the most frequently asked questions and commonly voiced concerns about packing cubes. Q: Should I get a packing cube set that’s waterproof? A: It should be said that getting one with that feature will add a few dollars onto the price tag but considering how cheap these sets tend to be on average, that shouldn’t be much of a problem. But barring that, if you expect you’ll be traveling a lot in the near future, or if the trip you’re looking for packing cubes in order to prepare for gets a lot of rain this time of year, then yes, it’s probably just the best idea in that scenario. After all, you never know when you’re going to be stuck outside in the pouring rain with your non-waterproof luggage for half an hour before the taxi finally decides to show up. Q: I need to stay on a tight budget, so I have some cash in pocket during my trip. So, if I buy a cheaper packing cube set, will I be sacrificing durability in exchange? A: Not even a little bit. The great thing about packing cubes is the fact that even the cheaper models are made of sturdier stuff than some suitcases. This mostly has to do with their size, as being small means, you have to spend less money on the high-quality materials. As such,high-gradee nylon and oxford fabric is very commonplace among packing cubes, allowing for them to take much more punishment than you would otherwise expect. Q: Why is it so important that a packing cube have mesh paneling? A: There are actually three different reasons for this. The first is that it allows items to breathe and ventilate while traveling. Even for inanimate objects and clothes, it’s imperative that enough air get into the case. Secondly, people mostly take packing cubes on airplanes because their lightweight and portable nature allow them to bypass the overweight fees. So, mesh paneling allows TSA to have a better look inside your cubes to see if there is anything worth being worried about hidden inside without having to meticulously sort through everything that’s in there and then put it all back in place. Finally, it helps you remember what you put in each cube if you didn’t get a cube set that labels each cube for you. Instead of having to waste time opening up each cube and looking through, you can just take a peek inside and find that outfit you planned on wearing tonight in a snap. Q: How many cubes do you recommend I get in a set? A: That all depends on how much you need to pack for the trip. For instance, if your trip is going to see you gone for up to a month, then a ten piece set is likely what you’re in need of. Packing cubes are very good at holding a lot more items than their size would have you otherwise believe, but the length of time you’re going to spend gone should always be taken into account. But it isn’t just cubes you need to consider, it’s also the kind of bags you want in your set, like makeup, toiletries, shoes, or laundry bag.